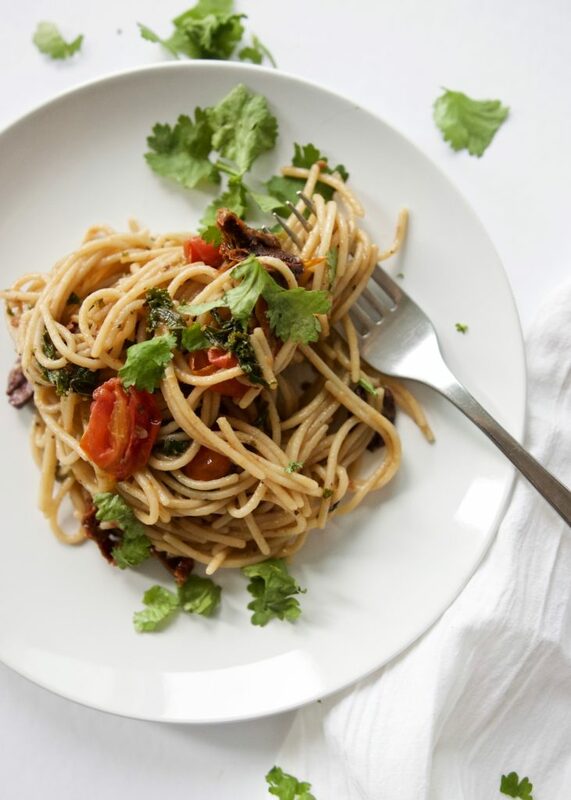 This Sundried Tomato & Olive Pasta is made with less than 10 ingredients and can easily fit into your list of quick-dinners-to-make during the week! Oh, and it’s freaking delicious. I’ve been making this Sun dried Tomato & Olive Pasta for months now. It’s become a go-to in my kitchen as a really easy dinner made with just a couple ingredients and absolutely loads of flavour. This dish is perfect during the week when you don’t have a ton of time (all you need is one pan!) and it makes fantastic leftovers for lunch. All of the ingredients in this pasta recipe mix perfectly. Sun dried tomatoes, kalamata olives, cherry tomatoes and the classic richness of oregano bring everything together. I also like adding just a bit of finely chopped kale for some mineral-rich goodness. You could also use spinach. 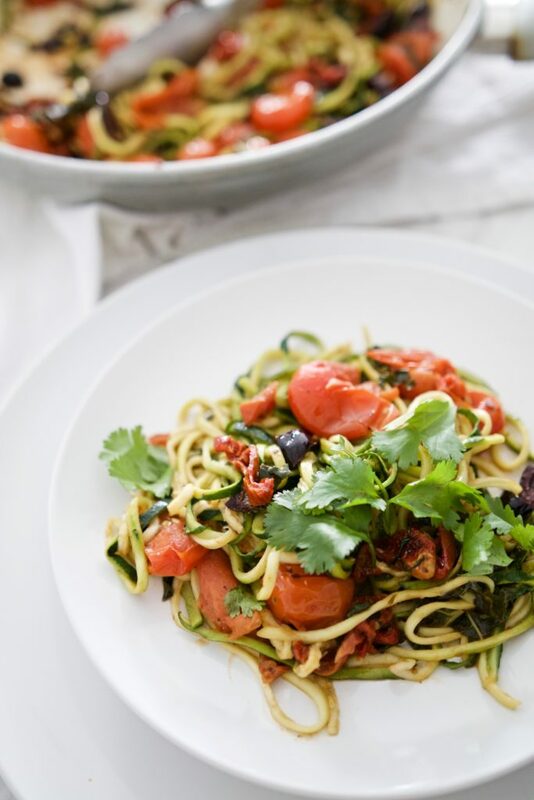 Of course, zucchini for noodles is what makes this recipe so wholesome (and paleo!) A regular brown rice pasta noodle works really well with this recipe, too. I like to use sun dried tomatoes that are dry in a package. I just soak them in warm water for 5 minutes or so and drain before using them. Sun dried tomatoes packed in oil are also fine; just drain out the oil first. I often pair this pasta with roasted chicken breast, sausage, or even sliced up and added to the sauce. I recommend adding a protein of choice to make this dish more satisfying. The best part about this pasta is that it can be made all in one pan — and in less than 20 minutes! Add all ingredients to pan with olive oil: cherry tomatoes, sun dried tomatoes, olives, kale, herbs & sea salt. Sauté over medium heat for about 15 minutes until cherry tomatoes soften. You can poke them a bit to release their juices. Spiralize your zucchini. 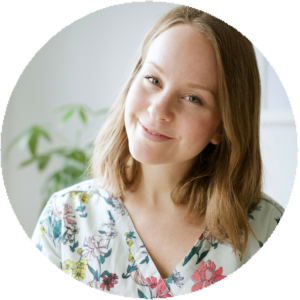 I have this handheld spiralizer that’s compact and doesn’t take up a lot of cupboard space! Add spiralized zucchini and stir, but only let cook for up to 2 minutes. Zucchini noodles get mushy very easily. Serve right away with roasted chicken breast, sausage, or your favourite meatballs! Remember, you can use also use regular pasta noodle instead. A simple but rich pasta dish made with a just few fresh ingredients. Add olive oil to pan and heat over medium. If you use sun dried tomatoes that are dry in a package, soak in warm water for 5 minutes. Drain. Or, simply drain oil from oil-packed tomatoes. Add to pan. Chop olives, finely chop kale, and add to pan with herbs, garlic and sea salt. Stir all ingredients together well and let cook over medium-low heat for about 15 minutes until softened. Poke wilted tomatoes to release some juices. 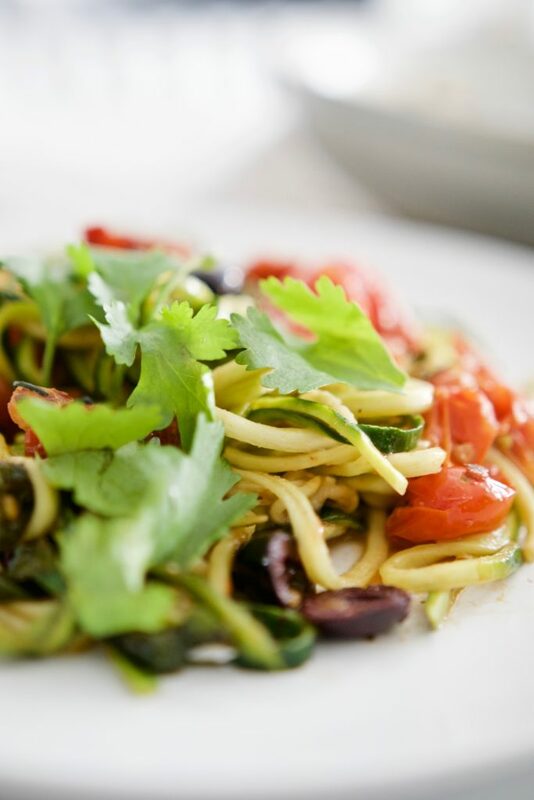 Spiralize your zucchinis OR if using pasta noodles instead, cook as per package directions. You’ll need about 4 cups cooked noodles. Add to pan and stir. 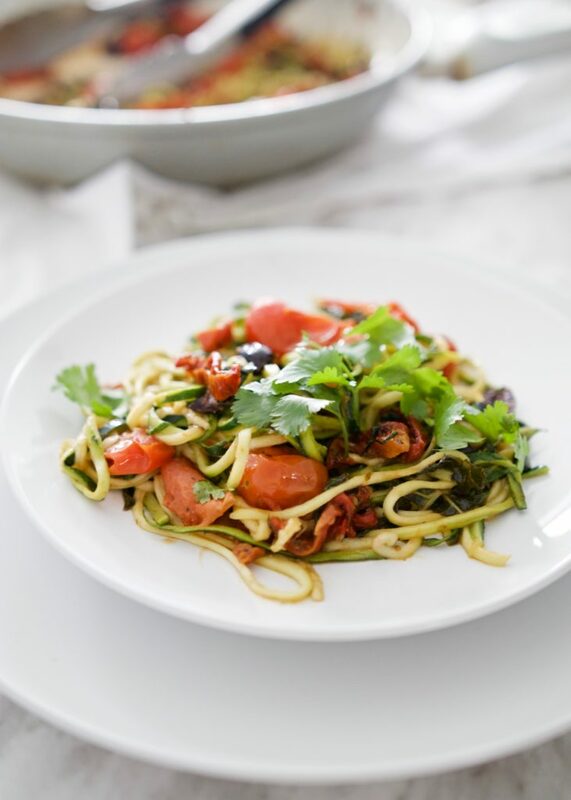 Do not let zucchini noodles cook longer than about 2 minutes once added to pan. They should still be slightly firm. They become mushy easily! Serve immediately with a side of roasted chicken, sausage, homemade meatballs or another protein of choice! Alternately, this can also be chopped and added to sauce while cooking. Enjoy! You can easily double or triple this recipe for additional servings. Have you tried this recipe yet? Let me know in the comments! Or, tag me on Instagram @meghanlivingstone. I’d love to see your pictures!